A near fine and thus scarce first edition of Landor’s autobiographical narrative about his failed attempt to reach Lhasa from the West, during which he was captured and tortured (at one point forced to ride many miles on a saddle mounted with iron spikes), and his discovery of the sources of the Indus and the Brahmaputra rivers. Together with a letter dated February 7th 1889 to a Mr. Browne from Landor, offering to show his sketches any day that would be convenient, and saying that he will be staying at 903, 16th Street, Washington DC for ‘about a fortnight’. This was the first expedition in which Landor, an accomplished painter, used a camera as well as paintings and drawings, resulting in these profusely illustrated volumes containing photogravure frontispiece, eight colour chromolithographic plates, fifty full-page black and white plates, 196 in-text drawings schematics and vignettes, and a folding map to the rear (outlined in colour) drafted from Landor’s own surveys. A detailed account, which pays a great deal of attention to geography and science, and one of the earliest works about the high Himalayas, which were virtually unknown to Europeans during Landor’s time. Although there was heated disagreement about the veracity of his tale, it was an international best-seller. ‘The book about his experiences, In the Forbidden Land, was translated into all the major European languages… In energy and resourcefulness, in courage and power of endurance, Landor was the equal of any of the previous generation of great explorers’ – Dictionary of National Biography. A rare set of this short-lived and ‘pioneering effort in photo-journalism’. Containing the complete four volumes of text, together with eleven of the original pasted-in photographs, seven of which are accredited to Thomson. ‘The China Magazine, edited by C. Langdon Davies, contained photographs by John Thomson, Henry Cammidge, Milton Miller and others. It was undoubtedly the inspiration behind John Reddie Black's better known Far East, which ran from 1870 until 1878. Apart from containing a number of photographs unpublished elsewhere, the China Magazine contains interesting feature articles which throw light on life in mid nineteenth-century China, Hong Kong in particular. The first issue of the China Magazine was published on 7th March 1868. It initially appeared weekly and then monthly until it reached it’s fourth and final volume in 1870. It was illustrated with original pasted-in photographs and it may have been the first publication of any kind in the Far East to do this.’ - Terry Bennett, History of Photography in China. Bennett states that surviving volumes of the China Magazine are extremely rare, interestingly noting that the China Review was offering sets of the four volumes ‘without photographs’ and missing some pages of text in July 1872. It is possible that this is an example of such a set, being complete in text, and containing 11 of the original photographs. Bennett also suggests that the January and February 1870 magazines are probably the final issues, the February issue ends on page 80, however there are a further 66 pages contained here, indicating there were either a further two magazines or the pages had already been set and printed so included in the consolidated fourth volume but the magazine itself was no longer being issued. The four volumes are - Midsummer (1868); Christmas (1868); Midsummer (1869); Christmas (1869); Volume IV of 1870 ends on page 146 with Chapter 5 of the ‘Fourth Book’ of ‘The Three Brothers’. The only other complete set we have had access to also ends on page 146. A fine and rare travelogue of an expatriate’s journey home from the Far East in the 1870’s. With his signature to the title page. This is no twelve hour Cathay business class flight for Peter Laurie [1838 - 1912] who worked with Jardine Matheson & Co. as an agent in Hong Kong, then Shanghai. The twelve month journey begins with ‘a good blow down the China Sea to Singapore, and fine weather thence to Penang and Calcutta’. Then overland on the new main railway line from Calcutta to Benares, which he describes as in a state of incompletion, with the stations not yet finished. From Benares they tour India on the old railway lines between Allahabad, Cawnpore, Lucknow, and Delhi, returning to Allahabad. The final leg of the recenyl completed Calcutta to Bombay rail link, took them through Jubbulpore ‘the junction of the two great Indian railways’ (a combined network of 4,000 miles). This route was one inspiration for Jules Verne’s ‘Around the World in Eighty Days’. Interlaced with Laurie’s details of the railways are thoughts and observations on the recent Indian rebellion and the sieges of both Cawnpore and Lucknow and subsequent massacres. Embarking on one of the Peninsular & Oriental Company’s steamers, Laurie proceeds direct through the Suez Canal to Port Said and then Alexandria. A scarce work in the form of letters covering Lawrence’s service in the marine corps on the US Steamer Wachuset, sailing from Boston in 1865 through the West Indies, via South America, the Cape and up to Java, arriving in Hong Kong to join the Asiatic Squadron in March 1866. The majority of this work covers his two years service mostly in China, with a short description of Japan of about 50 pages. Lawrence later served as a surgeon in the Army. Very personal and interesting observations of the people, places and happenings throughout his tour. With nine full page illustrations. A passionate and important account of the momentous Taiping Rebellion of 1850–64, which spread across southern China, involving the death of around 20 million people. 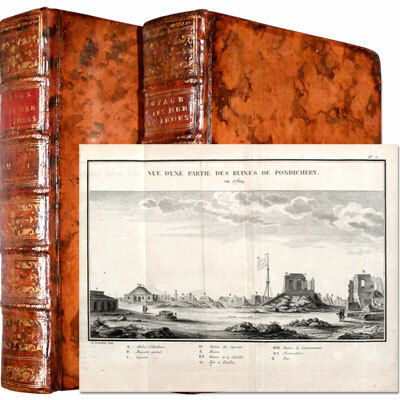 Two volumes in original publisher’s cloth, profusely illustrated throughout with eight coloured lithographs, eleven tinted lithographs (including the folding frontispiece), nine in-text wood engravings, and two folding maps of China outlined in colour. In 1860 a twenty year old English naval officer and supporter of the rebels, Augustus Frederick Lindley (1840–73), and his young wife Marie, daughter of the Portuguese Consul at Macau, accepted a commission from Taiping general Li Xiucheng, and helped train their soldiers in British Army techniques, while Marie became a sniper, both actively fighting for, and believing devotedly in their cause. ‘‘Every evening in the desert, the Lushingtons and their party, which included Lord Elphinstone, late Governor of Bombay, would settle down to a light supper of ‘roast turkey, ham, fowls, mutton in various shapes, curry, rice and potatoes, damson tart and a pudding; madeira, claret, sherry, port and... beer; ... almonds and raisins, watermelons, pumplenose (grapefruit)... and a plum cake’. There were thrilling ‘mummy-openings’ to attend in Thebes, balls in Cairo, and soirées in Naples and Paris. In fact the experience, said Mrs Lushington, was decidedly not to be missed.’ - Jane Robinson, Wayward Women. Judging from the frontispiece illustration, it seems the camels may have also benefited from the leftovers of the Lushington’s ‘light suppers’. A handsomely bound copy of Sarah Lushington’s entertaining and informative account of her journey from Calcutta to Europe, with notes on route, itinerary, and the necessities of travel for ladies intending to brave the ‘Overland Route’ from India to England. 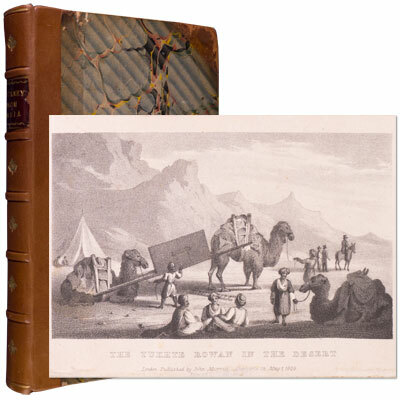 With chapters detailing many of Mrs Lushington’s experiences in Bombay, Luxor, Cairo, the Nile, Syracuse, Naples, and Rome, among others, and featuring an engraved frontispiece of ‘The Tukhte Rowan in the Desert’. A collection of twenty-four sentimental verses by Sir Alfred Lyall, and signed from him on the front free endpaper, elegantly bound by Rivière & Son. Sir Alfred Lyall (1796-1865) was a British civil servant, philosopher, editor, clergyman and traveller. He first arrived in Calcutta in 1856, and served a long career in the Indian Civil Service.